One of the beauties of reading lies in our ability to bring understanding not only in an expansive sense but more importantly, of ourselves. To a sociologist a tale may be a method of communication among a people; to a romantic, perhaps a deeper, more revealing peek into humanity itself. In either case a proper study of any subject helps to make us more fully aware of our past and present. 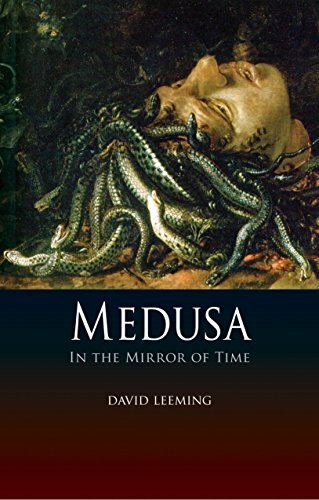 Medusa in the Mirror of Time takes on the classic myth of Medusa and tries to explain why it still captivates us. More scholarly exposition than customary biography, author David Leeming peels layers from the myth and views his subject from a number of perspectives. The result is a complexity that affords us a far richer foundation upon which we can build our understanding of both the myth and ourselves. From the start the author makes a point of clarifying the concept of myth versus religion. The classical Greek myths are easily accepted as being parables, but to truly understand the context of Medusa (and by extension all other mythologies) we must understand that for the people of antiquity these stories were part of their religion. The difference between religion and myth is a story can only be a myth if you don’t believe it—but stand inside, as the ancient Greeks did, and that same myth becomes something entirely different—it becomes divine truth. Mr. Leeming’s treatment of this notion is well placed in the beginning of Medusa, which brings a much more nuanced relief to the scholarship. But what starts out as an illustration of some surprising psychological aspects becomes slightly bogged down when he tries to filter the Medusa story through literature. The construct is well intentioned but the narrative loses some steam in the process. Most surprising, however, was the notion of Medusa as an icon for feminism. An argument is made that it’s Medusa’s beauty that immobilizes (turns others to stone). In this regard she is seen as subjugated to a male-centric system (via the guise of the hero Perseus) who decapitates her to restore patriarchal order. But given the quantum leap at every level of knowledge since antiquity, can we still say classical mythology is relevant to us today? Mr. Leeming makes a solid case for Medusa’s feminist underpinnings. Both Freud and Jung postulated different ideas to explain Medusa in terms of psychological symbolism. Their ideas alone, while comparatively modern, bridge an empirical gap that stood for millennia. Versace adopted the gorgon’s iconic head as a marketing device. What these and several other examples illustrate is the ultimate versatility and staying power of the Medusa story. Time waits for no one, yet despite the advances time brings, human nature at its core is largely the same. We relate to these tales because as they were then they are now—about us. J. W. Nicklaus is the author of The Light, the Dark, and Ember Between and is currently working on his first full-length novel. A twice-published poet, he also has written articles on the craft of writing and guest posts for numerous blogs. Presently an active member of a Phoenix-based writers’ group, he also freelances as an editor and ghostwriter.